Blackboard’s Grade Centre provides the ability to download assessment grades into a spreadsheet which can be passed on to your School Assessment Team, either electronically or in printed form. Downloading electronic grade data which has already been entered into Blackboard reduces the risk of error in transfer of grades to Assessment Teams and also speeds up the overall process. This quick and easy process should take you no more than 5 minutes. How Do I Download My Grades? In your Blackboard module, go to the Control Panel, select Grade Centre > Full Grade Centre. Select the data you want to download. We recommend choosing Full Grade Centre. Select the file delimiter, either Comma or Tab. We recommend choosing Tab. Select whether or not to Include Hidden Information in the downloaded data. If you have hidden columns or students from the main Grade Centre view, then they will not be included in your download unless you select Yes here. On the next page, click the Download button and save the file to a location on your computer. Do not change the filename – the filename contains the module code and will be used as a header when printing the spreadsheet to easily identify the module name. How Do I View My Downloaded Grades? Open Microsoft Excel (or an equivalent spreadsheet handling software) and open the file you have just downloaded. You may see a message on screen about the file format and extension of the file you are trying to open. Click Yes to continue opening the file. When opened, you should see a list of students and their respective grades for each assessment you created in Blackboard. The spreadsheet can be further manipulated to calculate totals or weighted totals, if you wish. Alternatively, you can create Calculated Columns in the Grade Centre before downloading the data. You may also wish to remove irrelevant columns, such as the “Last Access” column or any columns which are not needed for summative assessment purposes. Save the file if you want to send the data electronically to your School’s Assessment Team. Alternatively, you can print the data (see below). Tip: Before passing the data on to your School’s Assessment Team, please ensure that the spreadsheet contains only those columns which are relevant to the summative assessment elements of the module and that all columns are accurately identified. How Do I Print My Grade Data? Select File > Print > Page Setup. Click Header/Footer and then click Custom Header. Click the Insert File Name button to add the file name to the header (either left, centre or right – it’s entirely up to you). 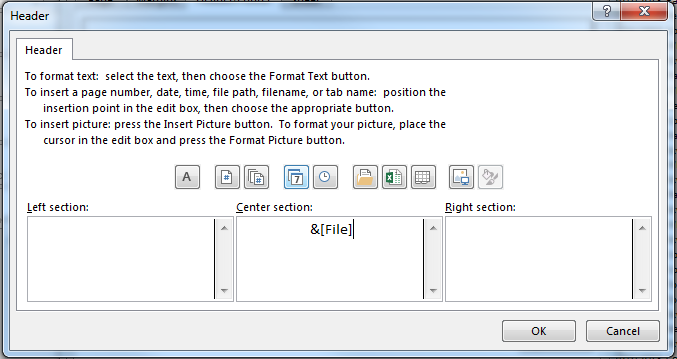 The file name has been added to the center section of the header in the example below. Click OK on each of the dialog boxes to close them down. You are now ready to print.